EAST MARLBOROUGH – Unionville High School hosted the Narcotics Overdose Prevention and Education (NOPE) task force on Wednesday evening. It was brought to the school by the district-wide parent network committee, FOCUS (Family Outreach Committee of the Unionville-Chadds Ford School District), which is a part of the Unionville-Chadds Ford Education Foundation. Thanks to them, more than 100 parents were in attendance to hear the NOPE task force deliver their powerful message from several perspectives and to get their homework assignments. Critical but simple homework assignments were given. Parents were urged to go home and talk to their kids and to go to their medicine cabinets. Parents need to share their concerns with their child and explain why they are opposed to drug use. One of these explanations was defined as “you want your child to live.” Now that is an important homework assignment. Parents heard from the task force on the effects of drugs and alcohol, a sergeant from the Westown police department who assesses car crash scenes in Chester County, and from a mother who suffered the loss of her teenage son to a drug overdose. The presentation evoked much emotion while dozens of large posters of the deceased stared back from the stage and pictures on the big screen flashed faces of the youth, their names, and their young ages. The mission of the task force is “to diminish the frequency and impact of overdose death through community education, family support and purposeful advocacy.” The vision – “A world free of overdose deaths.” Through vision, parents saw picture after picture and a short film on a big screen of kids who were found dead of overdoses. This was a very harsh approach but a very impactful one. A look around at the audience reinforced the impact of NOPE’s vision. Many were wiping tears away. The main messages were delivered with a huge dose of reality – all these deaths could be avoided. Peers can be the hero by telling someone that their friend uses drugs or alcohol. In fact, students were given that very message in a similar presentation during the school day. Parents can be the communicators by doing their job. They should be on alert at all times by being aware of the signs that their kid is using drugs, combining different drugs, combining drugs with alcohol and knowing the signs of addiction. They should log medications, get rid of expired pills and they should lock up prescribed medication. If prescribed medication by a doctor, each intake of each pill should be monitored by a parent. The issues can be combated by simply taking action. Chelsey Price, a prevention coordinator at Holcomb Behavioral Health Systems, encouraged parents to take action and seek help. Beth Mingey, the director of educational services at Holcomb, wanted parents to go one step further and tell family members and neighbors to do the same because if the prescribed drugs or alcohol are “not there, they can’t get addicted.” The statistics show that 70 percent of teens who abused prescribed drugs, got them from family or friends. She stated that parents are the biggest influence and the most powerful since youths are less likely to use (35-65 percent less likely) if they talk with their parents about drugs and alcohol. Sergeant Kennedy, dressed in his police uniform, told the audience he was there tonight for a number of reasons. He was there because he sees the effects of underage drinking as part of his job. (By the way, it’s not just drunk driving, it’s also drug driving.) He said he sees it 50-60 times a year at fatal car crash scenes in Chester County. He is also a recovering alcohol and drug addict of nine years. He stated that kids do drugs and drink alcohol because of peer pressure, to be social, to self-medicate as he did, to mask emotions, and to get through transitional periods of wanting to be grown up. He urged parents not to be the party house when it comes to drinking alcohol. Parents who attended the presentation voiced their opinions. One parent stated that they need other parents to be on board and not serve alcohol at parties or host sleep over events that they are clueless about what is going on. Parents were able to tell John Sanville, superintendent of schools, how important it is that the high school students, who missed the presentation due to PSATs, get the same opportunity as the other grades to hear the message of NOPE. Sanville agreed and would look into scheduling it. Signs that your child is using include actual physical evidence, changes in eating and sleeping habits, changes in physical appearance or behavior and personality, changes in friends and interests, changes in school or job performance and having a positive attitude towards drugs and alcohol. Every day 2,000 teens in the United States will get high for the first time by trying prescription drugs. Pennsylvania is the seventh highest state for overdoses in the country. Overdosing among youths is an epidemic. Another homework assignment – get help if needed. 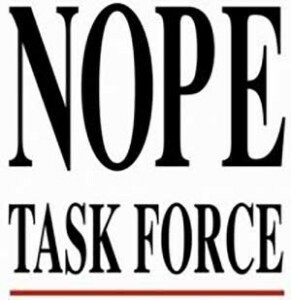 The NOPE task force can be reached by phone at 1-866-612-NOPE and on-line at www.nopetaskforce.org or www.facebook.com/nopetaskforce. A candle light vigil to honor those loved and lost through addiction will be held on Thurs., Oct. 23, at 7 p.m., at the Upper Chichester Municipal building, 855 Furey Road. Please go to the website for additional information. The Art for Pamela Exhibit and Sale to support the Pamela Stouch Scholarship Award, will be held on Nov. 30, from 1-6 p.m., at the Italian-American Club in Wayne, 301 West Wayne Ave. So proud of you Jacki (Smiro/Zwann). Make a difference where you can! We all loved RJ and he is walking beside you making a difference for those still affected. I can’t believe Pennsylvania is the 7th in country for overdose! Wow! It must have been a powerful presentation. I commend Unionville High School for hosting such an event and following up with this informative article. I’ll be sure to watch for the signs and stay involved in my children’s life. Life is so fragile and precious and some of these kids just don’t understand the consequences of doing drugs and what can happen. This article is something every parent should read! Thank you. Very informative!! Thanks so much for the great info!! Thanks so much for this concise summary on a very important topic. I could not attend the meeting tonight so I appreciate the information and will talk with my daughter about it. Wow – Very powerful and meaningful to ALL! Thank you for Sharing. Great Article!! high school for supporting them.